Our mail courier is a tad bit unreliable. There are days when he delivers the mail before noon but you can count on those days being the ones he only carries a fistful of bills. More often than not, he’s a post-lunch type of worker and recently I’ve even wondered if he’s decided an afternoon siesta is in order before delivering my goods. Though antiquated, and a huge drain on our wealth as a nation ($2.8 Billion losses in 2008), most everyone still likes to get snail mail from time-to-time. Even me. Especially when said letters are from clients who have paid their bill on time – a rarity, I have figured out. Monday I ventured down our driveway like most other days to check our nearly white mailbox to grab the usual handful of direct to shredder/recycle bin and bills. As I was climbing back up, I was taken back for a moment by a single, nondescript white letter addressed to me with the return address only listed by name. 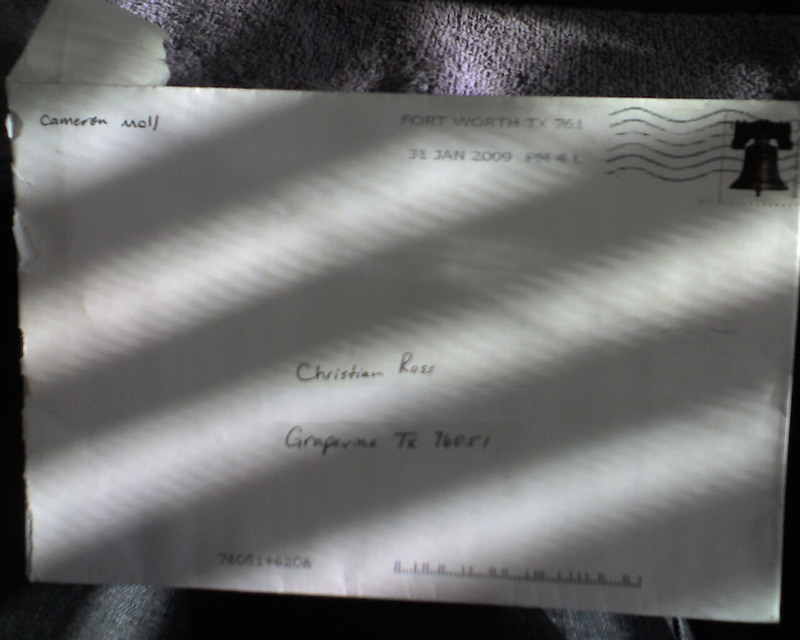 The envelope was greeting card sized and was hand addressed in black ink. The piece of mail wouldn’t have stood out in any pile but almost literally jumped out of my hand once I saw the sender. My mind raced as I walked back towards the house. Why in the world would this person be sending me a letter? How would he get my address? Was it from the book I purchased authored by him last year? He left no return address, it must be a form letter he sent to thousands and didn’t want to share his home address with all. These are just a few of the thoughts that ran quickly through my mind in the 10 seconds or so to get back into the house and drop the other mail on the table. For a moment, I was ecstatic. One of the most innovative designers in my field/era had sent me a letter! Cameron Moll is a very well-respected designer and author of all things web-centric. From a designers standpoint, I would say he is one of the three best designers out there doing web work today. And selfishly I wish he was doing more of it freelance/publicly. Add to the mix that he’s a family man, speaker, musician and a seemingly good guy; I was floored that he would find reason to send me a letter. Once inside the house, letter in hand and sans junk mail, I noticed the postage meter location. I’m pretty positive that unless this is where the majority of our post office losses are coming from, they wouldn’t stamp a letter from Salt Lake City with a Fort Worth, TX meter. From there it didn’t take much to figure out the rest. All of my excitement went for naught. Instead of getting a letter of some sort from a rockstar in my field, I received a sad reminder that my taxes are not far from being due in the form of a 1099. Thanks to my buddy Rob – a respectable designer in his own right – for the short walk of exuberance and for the simple reminder to never forget that what goes around can always come back around. Be prepared son, I hear that Scientology is looking for new members. I wonder what the receptionist at your Christian education facility will think as she posts an application in your box. 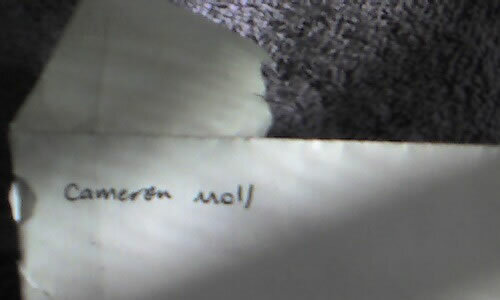 And to Cameron, if you do ever need to reach me by mail, hit me up and I’ll send over my address. And for good measure, a picture of my letter (click for full size) and some of Cameron’s work. And though I’m not Mormon, the detail in this letterpress poster he made of the Salt Lake Temple is outstanding. The entire thing is made out of letters and characters of different typography. There’s no need to be sorry, it was a classic move! Definitely one that I should have seen coming. HAHA! Oh yeah…paybacks are as real as death and taxes. Too funny. You got a couple real lol’s out of me on this one.